Today I will be reviewing a nail polish from polish e-tailer turned polish maker Llarowe. Her brand is called Colors by Llarowe and this polish is called Twinkle, Twinkle Little Star. I remember when she first posted about it on her facebook page, saying she was mixing colors and one of them was remarkably similar to Essie's infamous Starry, Starry Night polish, a very hard to find, and expensive when you do, vintage polish. As soon as it was available for sale I snapped it right up because I've been lemming SSN practically since I started blogging! Twinkle is a dark navy blue jelly packed with tiny square silver glitter pieces, like a stunning night sky. The formula was a bit on the thick side, I found it worked best when I applied it slowly. This is two coats and a top coat, although it is nicely shiny on it's own. I have seen comparisons between this and SSN and it's a touch deeper in color but is otherwise almost indiscernible. You can pick this up on Llarowe's website for $12 for a 12 mL bottle. What do you think of this polish? Do you own the Essie polish it's modeled after? If so, how do you think they compare? I still want the original haha, I'm a sucker for the "unicorn" polishes that are hard to find. Hi friends! Today I am being featured as a guest blogger on my friend Leslie's blog Work/Play/Polish. She is doing a series to highlight the charity Polished Girlz, a group "bring sparkle to the lives of girls with special needs or frequent hospitalizations by bringing the trendiest nail art parties to them, while teaching them the importance of hand washing to reduce infection rates and repeated hospital admissions". You can view my post here and be sure to subscribe to her so you can see all the other great guest posts she's planning. I can't believe I did nail art! It is a recreation of one of Instagrammer @amkuch15′s manicures, just switched up to different colors. Happy holidays! Hi everyone! I have an awesome handmade nail polish to show you today from indie seller Lacquistry. It's called Amazeballz, which is silly haha. It's not really a glitter, but more of a metal flake. It's a kind of silverish gold, more gold in the sun, more platinum in the shade. I love bling so I had to have this. All the swatches I saw online said it was opaque in 2 coats, but it took me three coats to get to this opacity and you can still see some bits where my nail pokes through in the sun, in the shade it's less noticeable. It dries smooth which is great. I love this because it's so fun and outrageous. Not something I'd wear everyday of course, but very cool. I think I will layer this over a solid gold shade like Revlon Gold Coin the next time I wear it. You can get Lacquistry products from their Etsy store. Amazeballz is $15 for a 0.5 oz bottle, expensive by indie standards, but I think the materials are more expensive so it makes sense. She sells a 1 oz. and a huge 2.5 oz bottle of this too, not sure why anyone would ever need that much but hey, to each their own! What do you think of this bling sensation? Another giveaway?? YES! I hope you take a minute to enter to win. Thank you for reading my blog and I hope you enjoy your last bit of 2013 :D Here's to a greater and more polish-filled 2014! Cheers! The Hobby Polish Bloggers are having their second multi-blogger giveaway! One winner will receive a $200 gift card to Llarowe, Ninja Polish, Harlow & Co. or via Paypal; and two winners will receive a $100 gift card to one of the same e-tailers or via Paypal. To enter, please allow the Rafflecopter widget to load below. All Terms and Conditions may also be found in the widget. Please visit the following Hobby Polish Bloggers members who are bringing this to you! You may enter using Rafflecopter from any of the below blogs but your entry will only count one time. You may, however, tweet about the giveaway (the last option) once a day for the duration of the giveaway. This gveaway ends at midnight on Dec. 31. Hi everyone! Thanks for being such loyal readers and checking out my little corner of the internet. Please enjoy this giveaway, enter your guts out and I hope you win! Love ya! 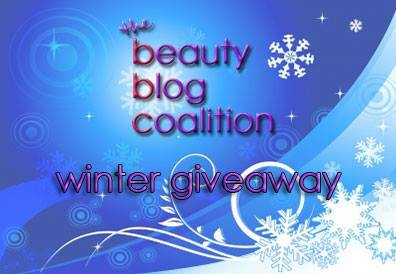 The bloggers from the Beauty Blog Coalition are at it again and want to give you the opportunity to win a little money right before the holiday season! Last month Cult Nails put out a limited edition trio of polishes called the Midnight Masquerade collection. They only made 500 sets and sold them for $24 until they ran out. I am really glad I was able to get them, they are my favorite Cult Nails polishes probably since they first started! First is Masquerade, a tealish green jelly packed with a heavy duochromed shimmer which flits from pinky purple to a smashing copper. Totally brilliant and beautiful. It's on the thin/sheer side, so this is three coats, with topcoat. Next is Midnight Mist, a greeny taupe woodsy brown with gorgeous gold to copper shimmer. This one glows from within like embers, which I love. I am enamored with this color, interesting and subtle and just beautiful. This is two coats. This is Ms. Conduct, a taupe brown crème with a plummy undertone. This is really lovely, a fabulously opaque and creamy formula. This is one of those classic polishes that I can see myself wearing over and over, despite owning more polish than I could really use in a lifetime. I used two coats here. My dears, I am sorry to make you pine for these beauties if you did not get a chance to pick them up before they sold out. I just could not live with myself if I didn't share their fabulousness. I am excited for the future of Cult Nails if they keep up putting out amazing colors like these! Check out their shop at www.cultnails.com.